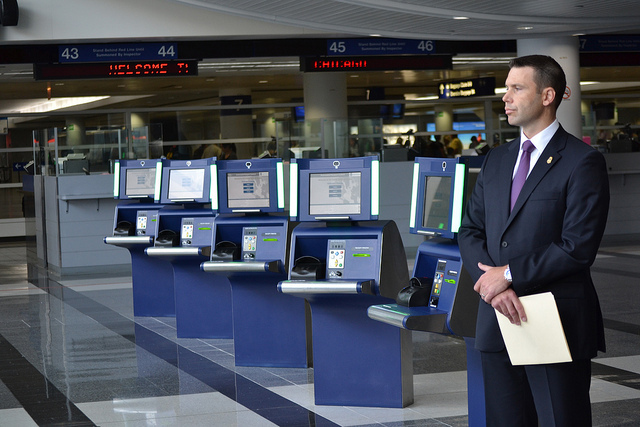 The US Customs and Border Protection (CBP) is making efforts to lessen wait times when arriving to airports with Automated Passport Control (APC). The Automated Passport Control is a free service that allows travelers to bypass the traditional customs declaration form and skip the officer interview upon international arrival. This effort is made to lessen the waiting times and long lines that occur when arriving internationally. In lieu of long lines and interviews, those eligible for Automated Passport Control will instead use one of many automated kiosks in selected airports to complete vetting on arrival. Those using the APC kiosks will be required to scan their passports, input flight information and answer inspection questions all through the kiosk screen. Travelers will be given a receipt from their kiosk and are then required to present their receipt and passport to a customs officer to finalize their arrival process. Holders of a US or Canadian passport are eligible for this beneficial program as well as those from one of 38 countries participating in the Visa Waiver Program. Travelers entering the US with a B1, B2, or D Visa are also eligible to use the Automated Passport Control program.Those with other international languages won’t have to worry as these kiosks are presented in ten languages including English, Spanish, and French. Not all airports across the nation allow for Automated Passport Control but there are many airports that do. These include New York (JFK), Los Angeles (LAX), Miami (MIA) and Toronto (YYZ). For a full list of airports check out the CBP website here. With the assistance of Automated Passport Control and APC kiosks, travelers will be able to take advantage of faster waiting times, and less crowding in the customs waiting area.